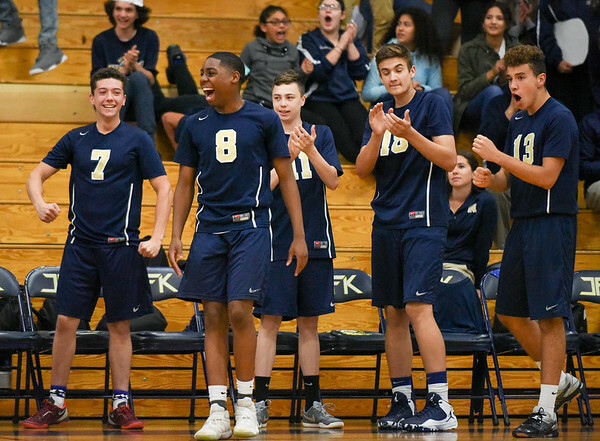 ENFIELD - It was another match and another win for the Newington boys volleyball team. The Indians got a little pushback from Enfield through Thursday night, but not enough to make it count as they swept the Eagles 3-0 (25-14, 25-15, 25-22). The win now puts Newington at a perfect 4-0 to start the season. Mason Romano led Newington with seven kills, while Dan Cloutier finished with 24 assists, Evan Metzger with five digs and two aces and Louis Egbuna tallied five kills. Newington 4, Bristol Eastern 3: It was a dramatic win for Newington. Just three days after losing to South Windsor in eight innings on a walk-off hit-by-pitch, the Indians topped Bristol Eastern on a walk-off hit-by-pitch. Mike Sobolewski picked up the win for Newington, while Jordan Brunette collected a double. Woodland 14, Goodwin Tech 2: It was all Hawks from the first inning on. Coming off of a 10-inning game yesterday, Goodwin Tech struggled, scattering just six hits and committing four errors. Chris Martinez picked up the loss for Goodwin Tech. Wilcox Tech 13, Goodwin Tech 12: It was a rough start for Goodwin Tech and they just couldn’t quite climb back. A seven-run first inning helped Wilcox Tech jump out to a 12-1 lead after four innings. But Wilcox Tech took out eight starters, including pitcher Briana Brown, allowing the Gladiators to fight back. With one out in the seventh inning and the tying run at the plate, Brown re-entered to finish the game and seal the win for Wilcox. “Once again we gave up many runs in the first inning and could not battle back for a victory,” Goodwin Tech coach Paul Soucy said. The Gladiators’ Tabetha Trammell finished with two hits and two RBI. Her teammate, Miranda Ramirez, had three hits and an RBI. Soannie Arroyo pitched well, coming in to relieve Ramirez in the second, third and seventh innings. Both pitchers only gave up two earned runs from the second inning on. East Catholic 13, Berlin 7: A poor first half hurt the Redcoats the most. The Eagles went into halftime with a 9-1 lead before Berlin outscored them in the second half 6-4. Mark Bednarczyk scored a team-high two goals for Berlin. Mitch Flyss, Peter Albert, TJ Hebert, Joe Pettinelli and Tyler Ralph also scored for the Redcoats. But East Catholic had four different players score multiple times throughout the evening, including Mike Bazzano, who found the back of the net four times. Vinal Tech 228, Goodwin Tech 244: Vinal Tech’s Kyle Kupec was the medalist in the match, while Josh Donaghy was the Gladiators’ low scorer after shooting a 58. Brandon Ketkeorsmy (59), Logan Stine (63) and Jackson Collin (64) were the other top scorer for Goodwin tech. Posted in New Britain Herald, Berlin, Goodwin Tech, Newington on Thursday, 12 April 2018 21:33. Updated: Thursday, 12 April 2018 21:35.